PLA Rocket Force: Adding fuel to the Dragon’s ‘Fire’? Recently China announced the upgradation of the PLA’s Second Artillery Force to PLA Rocket Force (PRF). Will the inclusion of nuclear and conventional ballistic missiles under the control of PRF make China lethal in terms of new warfare strategies? Is the Chinese End game aimed at keeping US on the edge? Will the PRF and Strategic Support Force be a game changer in terms of modernization of military forces? The new Rocket Force and the Strategic Support Force was announced in December 2015 by Xi Jinping, as part of the restructuring of the Chinese military. According to the Chinese reports, the PLA Rocket Force’s main mission, like that of the Second Artillery Force, will provide strategic deterrence with nuclear and conventional missiles under its control. Whereas, the Strategic Support Force is expected to provide proper electronic and cyber intelligence back up for the precision missiles strikes during war. The new Rocket Force, is expected to deploy its nuclear assets on land, sea and air. It is believed to be incorporating the Navy’s strategic nuclear submarine and the Air Force’s strategic bomber. This will make the Force, the world’s first independent service with land, sea and air nuclear components, more integrated than any other country. The formation of PRF serves as a major indicator of China’s ambition to up the ante with respect to strategic and nuclear defence by establishing the world’s most complete missile strike system. The PLA Rocket Force has been given a status equal to that of PLA, PLA Navy and PLA Air Force. Along with the nuclear missiles, the Rocket Force would also be in charge of the conventional missiles. This is an indication of the continuation of China’s “dual deterrence” policy which seems to have been intricately woven into the “active defence” policy. Active defence through offensive strategic policies is China’s signature approach towards national security. Also, the formation of the Strategic Support Force is considered as a reflection of how much importance the PLA is granting the new and rapidly growing domain of cyber and space. The Strategic Support Force is said to constitute of an aerospace army, an internet army and electronic warfare troops. Network attacks against satellites and ground based facilities that control the satellites would be China’s modus operandi during a conflict. So what is the larger Chinese endgame? Unlike the US and Russia, China is not constrained by any agreements that would cut down their missile production or limit the range of their missiles. This has helped China in establishing a complete ballistic missile strike system with their high precision, medium range missiles being the highlight of their missile system. China’s ambition to establish a military balance with respect to US and Russia is obvious through its serious attempts to establish an army that would be ready to win wars of the information age. The possible inclusion of submarine launched ballistic missiles into the Rocket Force, is a clear indication of China’s attempts to enhance its sea based nuclear deterrent and second strike capabilities. The enhanced sea based nuclear capabilities could be the Chinese way of gaining an upper hand in the geopolitical tensions with US in the Pacific Ocean region. The Strategic Support Force will aid the military during cyber and space warfare, which only further asserts China’s determination in having an upper hand in all domains of future conflicts. In November 2015, China conducted the sixth, successful test of its hypersonic maneuvering strike vehicle, DF-ZF (previously referred to as WU-14). The hypersonic glide vehicle is capable of radically changing its trajectory to avoid missile defences. The ability to fly at low, radar- evading altitudes makes them less vulnerable than existing missiles to the strong US missile defence systems. These warheads are capable of performing non- nuclear as well as nuclear precision strikes. China may use this warhead on a future generation of an Anti- Ship Ballistic Missile (ASBM). This has set US on the edge as they try and build a defence that is essentially centered on counterbalancing China. Having been an undeterred nation for a long time, the steady rise of China’s military might is sure to ring alarm bells for the US. China’s space weapons are proving to be another threat to the US satellites. With its new Strategic Support Force, China is all set to enhance its space weapon capabilities. The congressional US-China Economic and Security Review Commission warned in its most recent annual report that “China is pursuing a broad and robust array of counter space capabilities, which includes direct ascent antisatellite missiles, co-orbital anti-satellite systems, computer network operations, ground-based satellite jammers and directed energy weapons”. While the US Strategic Command (USSTRATCOM) is in charge of their nuclear, space, cyberspace and electronic warfare operations, it is not in charge of the conventional weapons. The PRF is in charge of China’s conventional as well as nuclear weapons. This added control of conventional weapons gives PRF a slight upper edge over the USSTRATCOM. As per the military reform guidelines released by the Central Military Commission of China, the overall administration of the PLA, the Chinese People’s Armed Police and the militia and reserve forces will fall under the charge of CMC. 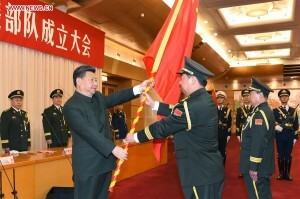 The concentration of control of the armed forces with the CMC is a characteristic of this military reform. The current year would witness enhanced military systems, civilian-military integration, improved combat personnel and reform of military academies and armed police forces. The formation of the Rocket Force is seen as a clear departure of the Chinese leadership’s focus on the PLA. As part of the new reform, China is said to be reducing its troops from 2.3 million to 2 million, with special emphasis on the phasing out of outdated armaments and development of new weapon systems. Hence with the PLA Rocket Force being accorded the status of the fourth wing of defence, the navy and the air force will also find themselves being treated at par with the other three Services. From the Air Force to Navy, Cyber to Space, the Chinese seem to be thoughtfully revamping their military structure to meet their future ambitions. Having realized the importance of space systems, China is developing capabilities that would deny access to these space systems during conflict. This can be viewed as an extension of their access-denial campaign. With its high precision ballistic missile system and an efficiently integrated defence system, China seems to be steadily moving towards its goal of building a modernized military. The PLA Rocket Force and the Strategic Support Force will play a major role in contributing towards this goal. While the PRF and the Strategic Support Force are aimed at setting US on the edge, this new strategy will also have major implications for India and leading Asia Pacific countries. As China moves towards modernizing and reforming its military, the notion of counterbalancing this strategy could result in stronger defence alliances in South Asia. Thus, China, with its robust military and rapidly developing space capabilities has reset the geopolitical game in its favour. mrunalini, congrats for this very good article,which i think has amply made clear as to why we should take china seriously. pdt. Jawaharlal Nehru in 1962 itself had called china “BHAI.”but surely with not having this BHAIGIRI strength in mind.